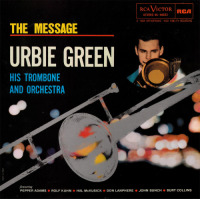 Urbie Green, one of jazz's smoothest and most polished trombonists who recorded more often than virtually any other post-war player, including Frank Rosolino, J.J. Johnson and Kai Winding, died on December 18, 2018. He was 92. Green's soft, yearning trombone on albums was unmistakable. His sound came off as a perfect high-register sigh, more akin to a vocalist than a horn player. His sultry solos stood out on albums ranging from Billie Holiday's Lady in Satin and Dizzy Gillespie's Gillespiana to More (Theme from Mondo Cane) and Antonio Carlos Jobim's Wave. An obit is here.